These trips, were part of the PADI Travel Eco Project to explore this conglomeration of atolls, islands and reefs aboard a diving liveaboard. And special because there was one researcher from Manta Trust on the liveaboard. Manta Trust is a leading non-profit organization with the goal of researching and protecting manta rays. These experts were teaching all about manta rays and answer all the divers questions. These expeditions have been scheduled to coincide with the most productive monsoon winds and lunar currents. These two factors strongly influence the movements and feeding habits of manta rays. The aim of these trips was to use the knowledge of Manta Trust experts to find feeding aggregations and allow the guests to experience the wonder of immersing amongst a feeding frenzy of manta rays. Just north of the Baa Atoll, the trip ventured into Raa Atoll, one of most unexplored atolls. However, this group of islands is regularly visited by mantas and hosts some stunning dive sites. Vertical walls covered in soft corals, gardens of anemones and mantas gliding above the divers heads are only a few of the marvels of the region. Ari Atoll is famous for being regularly visited by whale sharks. Venturing into this atoll, the divers were seeking out these gentle giants and had the chance to visit some of the richest and most spectacular dive sites in the Maldives. Ari Atoll also hosts the second largest manta population in the country, and divers had many opportunities to find manta aggregations and night feeding events at some specific sites. Finally they visited Lhaviyani Atoll, another spectacular northern atoll. Here sharks, schools of eagle rays, tunas and other large pelagic fish are the main characters in the dives. They also encountered more manta rays and went diving on one of the most beautiful shipwrecks in the country. During these diving holidays, divers had the opportunity to experience and participate in cutting-edge conservation research to protect one of the ocean’s most majestic animals. Divers personally contributed to the research by collecting photographic identification images of the mantas they encountered throughout their vacation. All new manta rays have been added to the database, and divers were invited to name these new mantas. Data Collection: The Manta Trust has a number of research projects worldwide, such as incorporating population data, researching manta movements, and completing genetic analyses – to name a few. These projects serve to further the understanding of the general ecology of manta and mobula rays. Hussain Rasheed (known as Sendi Rasheed) was the first PADI Course Director in the Republic of Maldives and a key figure in developing diving tourism there. During his career, which is on-going, he has certified over 1,600 divers. He is active in developing regulations for the Maldives Islands and also works to assist marine environmental projects. His work came to international media attention when he created and organized an underwater Cabinet Meeting, chaired by the President of the Republic of Maldives, to bring world attention the threat of global warming. He is the former Dean of the Faculty of Marine Studies at Villa College (2006 – 2008), overseeing four departments: Marine Science, Watersports, Scuba Diving and Marine Medicine. He is affiliated as an Executive Director of all Villa Dive Centres under his company, Dive Oceanus, operating five PADI Dive Centres across four different atolls in the Maldives, and supervising 40 diving professionals. He is a founding member of the Divers Association Maldives (DAM). Regarded as “the Godfather of the Maldivian diving industry” Hussain Rasheed, better known as Sendi, was born in Male’, the capital of the Republic of Maldives. He started diving in 1981 and became a PADI Divemaster in 1986, an Instructor in 1993, and Course Director in 2000. He currently focuses on teaching PADI Professionals and has been a mentor to literally thousands of new divers. Sendi has given numerous presentations at local schools, sharing his love and knowledge of diving and the marine environment, thus ensuring that the next generation of Maldivian’s understands their importance to the Maldivian economy, and also to the nation’s culture. Using regional television he has been able to further expand his programs delivering them to a much wider national audience. In recognition of his many efforts on behalf of diving and the marine environment, Sendi has received both the Maldives Tourism Award, and the Presidential Award. Each of these are major career acknowledgements, and together they recognize his contributions and ongoing dedication over many years. Sendi has been actively involved in the lobbying of all marine protected species and dive sites in the Maldives since he started scuba diving. As a witness to the decline in the area’s shark population he has been active in opposing shark finning and the sale of shark souvenirs such as jaws and teeth, and was an effective supporter of the 2010 national legislation that provided protection to sharks. Sendi’s 37 – year career shows his deep love of the ocean that he actively works to protect, and his educational abilities that produce a continuing stream of diving professionals that become Maldivian Ocean Ambassadors. Since his first breaths underwater, Sendi has seen the Maldives diving industry grow from a few explorers to a multiple million – dollar industry that directly benefits thousands of local Maldivian many of who directly or indirectly owe their role in the industry to him. Sendi thanks his father for inspiring him to venture out into the blue, and to succeed in his chosen field. “He taught me that the ocean was not something to fear, but that it had much to offer.” His wife of 30 years and their two children, he credits with the rest of his impressive journey. The immensity of the contribution that Sendi has made towards diving in the Maldives is indisputable. 2018 has been a successful and busy year in the Maldives. As Regional Manager I have been out and about supporting Dive Centers and Instructors with a host of activities and events. So, what has been happening? Member forums, specialty workshops, business development workshops and AWARE Week, are just a few of the many events across the Maldives. I would like to thank you for your continued commitment and support at these forums, training days and events. It has been particularly inspiring to see how many PADI Professionals have taken part in the DPV workshops around the Maldives. PADI has teamed up with BluEmotion, the official SUEX DPV distributor in the Maldives. As a result of this partnership, we have been conducting several unique ‘Business of DPV’ training events in the Maldives. Diver Propulsion Vehicles have proved crucial business tools for dive centres in the Maldives, however the techniques involved in maximising their effectiveness are often misunderstood. The aim of the two day workshop was to not only show how these DPV work and how to include them in the dive centres daily operation, but also to give staff the tools to successfully sell PADI DPV courses in order to increase certifications and revenue. There is a range of support available as well as assets ready for your use. Be sure to use the PADI Dropbox account for access to the latest marketing materials. As well as this, the PADI YouTube Channel and the image library on Flikr is a great source of visual content available for use. There is also a host of support available if you are looking to step outside your center and run an event or take part in a show. A floating ball of spines drifts past. This ball of spines is actually the most poisonous fish in the world and is responsible for multiple human fatalities every year. But what are the facts? Should you be worried? No! Pufferfish are a diverse family of fish. They are found worldwide and have over 100 species. Although some species have adapted to live in brackish and freshwater the majority are encountered around the tropics and subtropical ocean waters. In the Maldives we have 5 genera and 18 species. They have a distinctive appearance with their long tapered body and large round head. These pufferfish can range from two centimetres long to almost one metre. In the Maldives the largest pufferfish is the Starry Pufferfish which grows to almost one metre and the smallest is the White-spotted Pufferfish which is around eight centimetres. Pufferfish are mostly bottom dwelling, inhabiting either reefs or sanding flats. Larvae are pelagic and a few species are completely pelagic. In the Maldives we also have four species of porcupinefish which are in a different family to pufferfish – they belong to the Diodontidae family. They are very similar to pufferfish; the defining difference is that the porcupinefish’s body is covered in visible sharp spines that become upright when inflated. Pufferfish spines are not so visible prior to inflation. Porcupinefish in the Maldives are uncommon and are encountered individually. During the day they take shelter at depth, at night they become more active. Sometimes large porcupinefish can be found hovering around shallow reefs during the day – the reason behind this is currently unknown. Whilst some pufferfish species have distinguishing bright markings over their bodies to show off their toxicity, for example the Saddled Pufferfish others camouflage themselves to match their surroundings. They are a scale-less fish with rough or spiky skin, beady eyes and all four teeth are fused together to form a beak. Big pufferfish use their beak to crack open and consume clams, mussels and shellfish. Smaller pufferfish prefer algae and smaller invertebrates. Most pufferfish are highly toxic due to containing a toxin called tetrodotoxin. The fish obtain this poison from vibrio bacteria which is found in the animals they eat, specifically from eating starfish and turban shell. Tetrodotoxin is a neurotoxin which is flavorless, odorless, heat stable and causes nerve paralysis. The location of the poison changes between species and is generally found in the liver and ovaries. To humans this poison is 1,200 times more poisonous than cyanide and there is enough poison in one pufferfish to kill 30 people. Additionally there is no known antidote. It is believed that pufferfish underwent a spontaneous mutation that caused structural changes in the fish allowing them to incorporate this bacteria containing the lethal toxin in their bodies to their advantage. Sharks are the only known animal to be immune to pufferfish poison. Although the toxin will kill, current research is testing whether low doses have medical benefits. Studies show that the toxin may relieve pain particularly with cancer patients. This could be an alternative to opiate use and it has also been shown to reduce opiate withdrawal pain. Even though it is well known that pufferfish are highly poisonous and can kill it doesn’t stop people eating them! Pufferfish is popular to eat steamed, roasted, in broth or hot pot and as sashimi. In Japan and Korea it is considered a delicacy. A pufferfish dish, called Fugu which means swell up has been eaten in Japan for over 2000 years, although during this time there have been restrictions. For example, in the 16th century Japan’s supreme war lord ordered that the eating of Fugu was illegal. This was in response to some of his troops dying after eating Fugu whilst he was rallying them to invade the Korean Peninsula. Whilst some people continued to eat Fugu in secret prohibition did not end until 1887 when Japan’s first prime minister went to a restaurant. The local fisherman had not caught anything and only Fugu was available – the prime minister was served it and he loved it. The year after this the ban was lifted in that region. Other regions shortly followed. In Japan there are now 22 different species that have been approved to eat. To serve pufferfish the chef must have a certification. Training for this certification takes seven to ten years and includes a written examination, together with the chef being able to gut and remove the poisonous parts of the fish within 20 minutes. Two types of pufferfish are very popular: Torafugu (luxury option) and Mafugu (cheaper alternative). Typically one kilo of Torafugu costs $200USD. The process of toxin removal has improved over time with it now being possible to completely remove the poison from the ovaries of fish. The ovaries are pickled for one year in salt and then for a further two years in rice bran. During the pickling process fermented sardine extract is poured over the ovaries to mature them. This removes the poison and delivers flavour. The science behind this process is unknown and only a few places are permitted to produce it. Additionally in some aquaculture facilities poison free pufferfish are being bred. They are bred in sterile environments where no vibrio bacteria are present. Theoretically the pufferfish should not be able to store the poison because there is no poison in their diet. These facilities are focusing their research on the liver. They have sampled 4000 fish livers over a nine year period and none of these fish were found to have the toxin. Now in special places poison free liver can be eaten and it is said to be very tasty. The poison is a major deterrent for predators, but this is not the pufferfish’s only defense. When the pufferfish is threatened they can inflate by 40% making them harder to eat since they become a large stiff ball. For a mature fish this process takes around 15 seconds. Inflation is as a result of the fish unhinging their jaw and rapidly gulping large amounts of water (or air if the fish is out of the water) which causes their body to expand/puff up. The ability to inflate is mainly due to the pufferfish having an elastic stomach – the stomach has a special large and folded lining which allows it to expand and accommodate a large volume of air or water. The pufferfish’s skin also has collagen fibers which allows it to stretch and not break. Additionally most pufferfish lack some ribs and have no pelvis which allows them to become a ball shape. It takes the pufferfish around six hours to return to normal size and during this time they are vulnerable due to their increased size and lack of mobility. The process of puffing up is also very exhausting and can be damaging to the fish. For these reasons it is important that divers and snorkelers are respectful of pufferfish and avoid triggering their inflation by scaring or antagonizing them. We have a variety of pufferfish that can be seen around Gili Lankanfushi. So next time you’re here grab your snorkel and camera and take a look! The Maldives is a tourist hot spot for dolphin cruises. These majestic animals are found commonly around Gili Lankanfushi and never disappoint with their impressive aerial displays and playful attitude. The Maldives is a dream destination for wildlife seekers and ocean adventurers. The ocean temperature averages between 27 – 31°C, contains plentiful fish and has incredible visibility. This makes it an ideal location for cetaceans: whales, dolphins and porpoises. They are aptly named as the word cetacean means huge fish. Spinner dolphins are a common species of dolphins seen in the Maldives and worldwide. They are easily identified due to their tricolor pattern, the upper side is dark grey, the middle a light grey and the underside white. They have a defined dark line from the eye to the flipper and an elongated nose. They get their name due to their unique jumping behaviour, they are the only species of cetacean to spin laterally in the air. The maximum number of spins recorded is seven. These spinning displays can vary, these variations are thought to be caused by habitat differences. Spinner dolphins are usually found in coastal environments generally associated with island chains or atolls. Spinner dolphins have a high re-sighting rate which indicates high site fidelity. During the day they use bay areas to rest and socialise, at night they venture offshore to hunt. These resting bays are generally in close proximity to feeding grounds, have a flat and sandy bottom with a depth around 20m. These features allow the dolphins to use only vision (instead of echolocation) to keep a look out for predators. If visibility is poor the dolphins are unlikely to rest as they are vulnerable to predation. Reproduction in spinner dolphins varies greatly between sub-species. Their calving period is year round with a gestation time of 10.5 months, after birth the calf will nurse for two years. The period between calves is three years. Females reach sexual maturity earlier than males (seven for female and seven to ten for males). Spinner dolphins have predictable daily patterns but there social structure is variable. Group size varies with habitat, with some open ocean populations traveling in groups numbering thousands. Group size could be dependent on the size of the sandy bay bottom and activity, for example resting group size is smaller than hunting groups. Dolphins living in remote reefs and atolls have higher affinity to each other whereas coastal population are more changeable. In coastal environments individual groups rest separately during the day and can come together at night to hunt. These dolphins typically hunt prey that live in deeper water but migrate vertically at night following the plankton. Feeding occurs at depths between 200 – 400m and includes fish, shrimp and squid. The size of the prey is small (five – 15cm) with males preferring lantern fish and females cuttlefish. Spinner dolphins along with bottlenose dolphins are vulnerable to a variety of human activities and developments. The majority of bottlenose and spinner dolphins in the Maldives reside in coastal environments which makes them highly susceptible to human activities. Coastal habitats are becoming degraded and as such management of coastal environments is critical for dolphin survival. Both species of dolphin are particularly vulnerable to human activities including dolphin watching, swimming with dolphins, pollutants including acoustic and chemical pollution, gillnets, by-catch, hunting, habitat degradation, boat traffic, sea planes, climate change, purse seines and trawling fisheries. As awareness about the threats to the planet grows there is a shift from activities that degrade wild animal populations to activities that educate and raise awareness. The number of participants for dolphin watching activities is growing and highly profitable. Dolphin watching has many positives; less invasive than swimming with dolphins, reduced desire from aquariums, alternative employment, reduced hunting and by-catch. Unfortunately some dolphin watching activities have little or no regulations and can be conducted in a manner that is negative for the dolphins. These activities can alter feeding, resting and reproductive behaviours. Stressed behaviour can be exhibited as changes in swimming speed and direction, changes in communication, respiration rate and aerial behaviours. It has been observed that cetaceans avoid areas with heavy boat traffic and it is thought that disturbances to dolphins could lead to increased injury rate, unsuccessful reproduction, increases stress and damages survival probability. Prolonged disturbance may lead to permanent relocation of dolphin populations. A common misconception people have with dolphins is that they can leave if they aren’t happy, dolphins can find themselves too stressed, confused and blocked in by boats to leave. Additionally, many dolphins are reliant on coastal environments, moving away from the coast can lead to diminished survival chances. As more research is conducted it has become apparent that dolphin watching can be executed in a sustainable way. The Maldives is home to 23 out of the 85 cetaceans species globally. The most common encounters are spinner and bottlenose dolphins. The cetacean species here are very diverse; they range in size from one metre with a weight of 50kg to 30 metres and weighing over 150,000kg. The distribution of coastal dolphins is thought to rely on a number of factors including temperature, prey concentration, location, salinity, depth, tides, habitat type, type of ocean bottom and predation pressure. The closest living relatives to cetaceans are hippos and other hooved animals like camels and pigs. They diverged from this group over 50 million years ago. The ancestor that made the leap from land to ocean is Ambulocetus which translates to running whale for it could both walk on land and swim, although it wasn’t great at either. This mammal lived in Pakistan and was around three metres in length. Its home was the brackish waters that reside in mangrove ecosystems. Over many millions of years Ambulocetus evolved into the cetaceans that we see today. The changes include the streamlining of the body, the hind limbs regressing, a decrease in hair, increases in blubber content, expansion of the hand bones into flippers, the relocation of the nostrils to the back of the head and changes to the snout. Bottlenose dolphins are a long lived and larger species of dolphin with a length between two to four metres. Females live around 50+ years while males reach their 40’s. On the upper body they are grey in colouration whilst the underside is paler with the belly being white. Stripes can be observed from their eyes to the blow hole, older dolphins can exhibit spotting on the underside. These dolphins live in a variety of habitats including the ocean, tidal creeks, rivers, lagoons and estuaries. Bottlenose dolphins are one of the most extensively studied species of dolphins as they inhabit inshore environments making them more accessible. The main calving period for bottlenose dolphins is late spring/summer when the water temperature is at its peak, although they can give birth year round. These dolphins have a yearlong gestation period with an interval of three years between each birth. After birth the calves remain with their mothers for three – four years, this duration is dependent on nutrition and size. These years together are critical for development of social, foraging and courtship skills. These skills can vary greatly between habitats. Weaning of calves starts after three years and within 10 months of the mother’s next pregnancy. The age at which dolphins reach sexual maturity ranges considerably. Females are considered mature between four and 13 years and males at seven to 16 years, the difference in age is dependent on geographical and environmental differences. Different species of bottlenose dolphins travel in different pod sizes, for example one species prefers travelling in pods between five – ten individuals whilst others in pods between 25 – 100. This variability depends upon food availability, activity, time of day and number of calves. Within these dynamic groups there may be an affinity between a few of the dolphins. These associations are hierarchical and depend on individual range and habitat type. These affinities usually occur between same sexes and mothers and calves. They have been known to last many years, with one association lasting 13 years. It has been observed that females have stronger associations and a larger social network than males. When hunting bottlenose dolphins use the entire water column and feed on a variety of prey including fish, cephalopods, eels, small rays and sharks. Foraging methods depend on habitat, number of individuals and prey type. Dolphins are known to feed individually, in small groups and can use cooperative feeding strategies including circling, herding and bubble blowing. Dolphins are intelligent hunters, for example some have learnt to follow trawlers whilst others have been observed to use sponges on their nose for protection during hunting. These dolphins can make seasonal movements in response to prey location, water temperature and predation threats. Bottlenose dolphins share their habitat with other dolphins including spinner dolphins. It is thought that the different species are able to live together due to differences in prey requirements and social behaviours. This co-existence is seen more commonly in the tropics and around coastal islands. This could be due to the higher concentration of nutrients compared to the open ocean. From the very beginning of a divers training, the importance of being and having a good buddy is emphasised, it is one of the key aspects of recreational scuba diving. As well as helping reduce risk, a buddy should enhance your dive from start to finish – a shared experience is always the best! They are an extra pair of hands when donning the scuba gear and taking it off again at the end of a dive – why struggle alone when a buddy can help? Navigational help – two brains are often better than one in navigational challenges! Someone to share amazing sightings with and most importantly, a witness to the countless sharks, super rare critters and giant manta rays seen – without a buddy the story just wouldn’t be believable! A second pair of eyes on the reef and in the blue – diving with a buddy presents double the chance of spotting something really amazing. Safety stops can be a time of quiet contemplation of the dive just completed and they can also be a time of funny faces and silly signals…and a lot of laughing bubbles drifting up to the surface – a buddy can be an excellent source of entertainment, diving is meant to be fun after all. Divers usually find themselves travelling without a dive buddy in tow but this is not a problem at all – especially when diving with Prodivers Maldives. Buddy teams are agreed on the boats and the instructor guiding the dive is always very happy to accompany anyone who isn’t paired up. It’s beneficial for the buddy teams to stay with the guide anyway as they know the reefs like the back of their hand and can point out all the really cool stuff. As divers get more experienced they may be tempted to go and dive on their own, they may think that they can handle anything and become quite blasé about the risks involved. The fact is that scuba diving is a high-risk adventure sport IF embarked upon alone, but when the correct procedures are followed and the buddy diving system is adhered to, the sport enjoys an excellent safety record. No matter how experienced a diver is a good buddy is as essential as the tank on their back! Shark Week 2018 saw the teams at Prodivers dive centers celebrate these amazing creatures in the best way possible – spending time with them in their natural environment, the ocean. 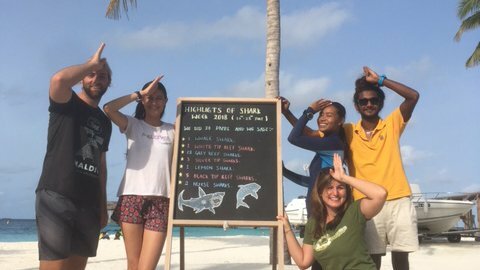 The teams’ love of sharks is well-known, as is the Maldives for being a world-renowned shark diving hot-spot, and their love was shared on dives and snorkel trips as well as in the classrooms, on the boats and pretty much anywhere else they could! Prodivers even shared their sharky love with the world on Facebook and Instagram too! If you missed Shark Week don’t worry – every week is a shark week with Prodivers Maldives! Instructor Steve and repeater guest Markus opened shark week on Hurawalhi with an amazing dive on Kuredu Express, where grey reef sharks were hunting and cleaning. Steve and Markus, together with other guests, were lucky enough to snorkel with a whale shark, also on Kuredu Express, just before the last dive of shark week. The Prodivers team on Hurawalhi did in total 20 dives in which we saw 7 different species of sharks: 1 whale shark, 1 white tip reef shark, 88 grey reef sharks, 3 silver tip sharks, 1 lemon shark, 5 black tip sharks and 2 nurse sharks. 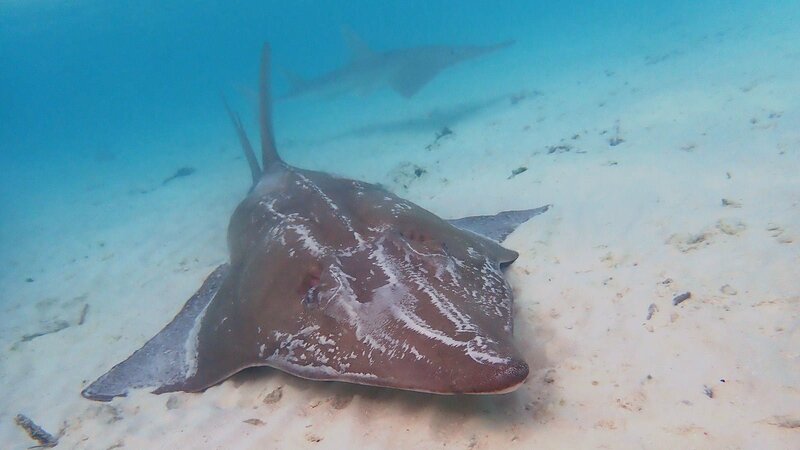 Besides the fact that it’s always shark week on Komandoo with the baby blacktip reef sharks patrolling around the island all day, the divers and snorkelers on Komandoo were very lucky as they had a couple of special encounters with Guitar Sharks during shark week around the island. All scooter divers also enjoyed uncountable sightings of nurse, grey reef, lemon and silvertip sharks while crossing the channels of the Lhaviyani. There’s just one word for Shark Week on Kuredu: EPIC! Kuredu’s Shark Week couldn’t have been better: It started off with an epic early morning sunrise dive at Kuredu Express with grey reef sharks, a mobula manta ray, a silvertip shark and even dolphins under water! The team did scooter introductions and insane channel crossings where they saw a big school of eagle rays accompanied by lots of grey reef sharks, lemon sharks, around 50(!) silvertip sharks. The participants of the PADI Maldivian Shark & Ray Distinctive Specialty Course were also very lucky: Before they jumped in for their dive at Kuredu Express, they spotted on the top reef a whale shark and had the chance to snorkel with it! As this is a very rare sighting in Lhaviyani Atoll, all guests and the whole Prodivers team were super excited and happy about this incredible encounter! Lily Beach arranged exciting trips for divers of all experience levels to search for sharks and identify the different species of common in South Ari Atoll. The highlight of the week was definitely a mature guitar shark on Kalu Giri, followed by a whale shark whilst snorkelling at Ari Beach. The biggest surprise: a massive silver tip reef shark at Vilamendhoo Thila during the current check, during the dive grey reef sharks, white tip reef sharks and a nurse shark resting on the top reef. Even the Bubblemakers spotted blacktip reef sharks during their sessions in the lagoon. Big smiles everywhere as we spotted sharks on all our dives during this special week. Vakarufalhi had an amazing week of sharks! As they had their boats filled with experienced and advanced divers, they were able to visit some of our more challenging dive sites. Diving into a strong current is always thrilling, and comes with rewards: among black-tips, we spotted some silvertip sharks! 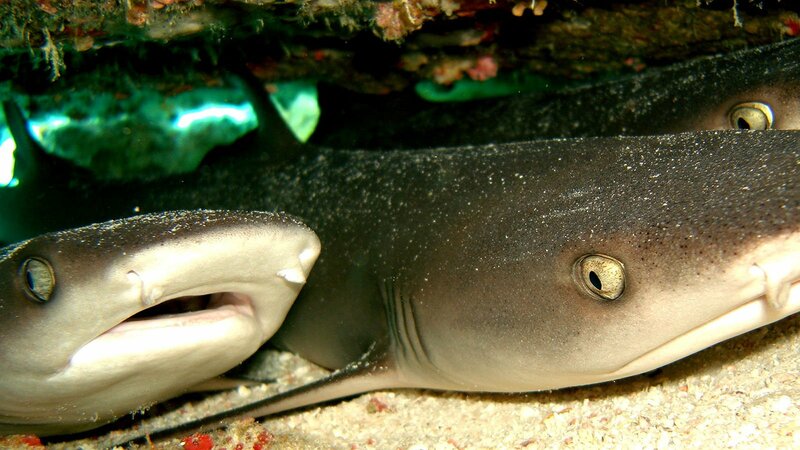 Silvertip sharks are a rare, oceanic species, that live nearby deep drop-offs. The place they can be often seen by divers is a shallower reef, serving them as a cleaning station- just like the dive site named 7th Heaven. Divers on the house reef also had a good time with the sleepy nurse shark and some white-tip reef sharks! The lagoon is a nursery for baby white-tip sharks, while their parents can be encountered around the reef, and for the ones who are obsessed with big fish: a whale shark has been seen also during the week. 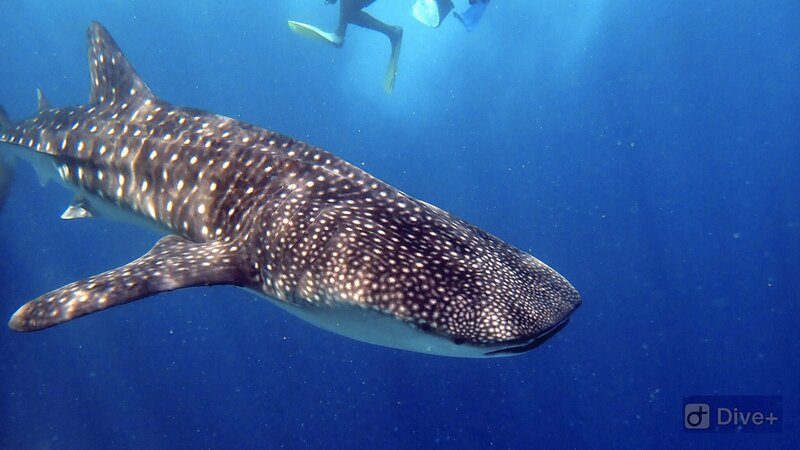 Vakarufalhi is only 30 minutes away from the marine protected area near Digurah Island, well known for whale-sharks! Hurawalhi Maldives is proud to announce that the resort’s Marine Biology Center, a Manta Trust research facility, is set to host a Marine Science Workshop, the first of its kind in Lhaviyani Atoll. The workshop, which will take place on Saturday, 14th July 2018, invites marine biologists, dive instructors, snorkel guides and tour operators in the region (Lhaviyani Atoll) to come and meet their fellow ocean advocates and to equip themselves with the knowledge and tools to provide their guests with the most up-to-date information; what’s more, the workshop will look to further instill sustainable tourism values and practices in the atoll’s community, and facilitate better research collection and collaboration in the atoll. The workshop will be led by Manta Trust’s Project Manager and Hurawalhi’s Resident Marine Biologist, Kirsty Ballard, who will educate attendees about Manta Trust’s Maldivian Manta Ray Project‘s most recent finding. Kirsty will be joined by representatives from Atoll Marine Centre and Olive Ridley Project who will discuss their current turtle and clownfish research projects. The Workshop was a huge success! Participants from Hurawalhi, Kuredu, Komandoo, Kanuhura, Cocoon and Atoll Marine Centre had a fact-filled day. Hungry for knowledge, they were all ears during introductions from Kirsty Ballard who organised the event and Mohamed Solah, Director of Operations at Hurawalhi, and subsequent presentations: Kirsty further expanded on the Manta Trust research and findings, Dr. Stephanie Köhnk (Olive Ridley Project team member and Turtle Biologist and Educator at Kuredu) provided insights into sea turtle research, Atoll Marine Centre team shared knowledge on turtles, clownfish breeding programme and coral propagation, and CorAlive spoke about coral accretion methods. Hurawalhi was pleased to have had the pleasure to host the Marine Science Workshop. We are certain that the resort’s Marine Biology Center will play an important role in educating marine users and providing tools to ensure tourism activities are conducted in a sustainable manner also in the future. 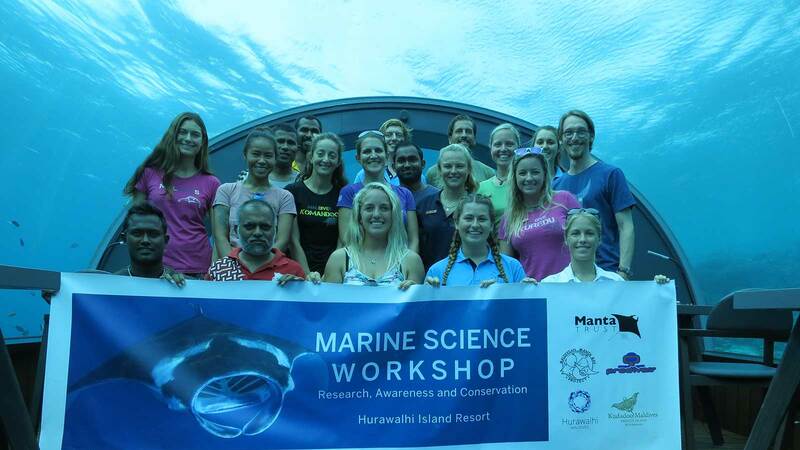 This was the first marine science workshop of its kind in Lhaviyani Atoll and both Hurawalhi and Manta Trust are confident in saying that it provided an excellent starting point for an even more increased and integrated research collaboration within the atoll.